Rocks can be found on the ground as loose rocks throughout the world, as well as from mining raw stone. Stone tool heads are made by knapping two rocks together. The durability of the resulting tool is dependent on the hardness of the stone used to create it. From softest to hardest: Sedimentary, Metamorphic, Igneous Intrusive, Igneous Extrusive. Note: Not all tools can be made out of stone. Only Rock Salt rocks can be ground into salt. Breaking loose rocks drops flint. Added arrow recipe that uses rocks. Javelin recipe requires rocks instead of flint. Breaking loose rocks drop rock items. Added knapping for stone tools, craft two rocks together to open the UI. Mining raw stone gives rocks. Right-clicking the rock on a surface will place a cobblestone block. Updated all cobblestone related recipes to use rocks. Harvest loose rocks for a chance to find small pieces of ore. Loose rocks vary in size and shape. Knapping performed by right clicking with two rocks instead of crafting two together. Added cobblestone recipe. Rocks no longer place as blocks. Breaking cobblestone blocks drops the full block instead of loose rocks. 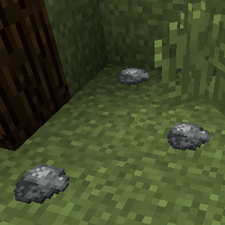 Cobblestone can be crafted back into loose rocks. Sneak to show advanced tooltips on rocks. If a loose rock is broken via explosion, it drops an invisible loose rock item. Placing this item simply spawns a new loose rock on the ground. Loose rocks share the same texture as the stone of the top layer beneath them. Loose rocks have a chance of spawning a small piece of ore instead of a rock if there is an ore vein nearby. Some rocks laying on the ground. This page was last modified on 23 April 2015, at 00:21.